A loan of $5,000 helped my business grow to different markets. My name is Antonio Gutierrez, I was born in Michoacán, Mexico. I was raised by my grandma and uncle. At a very early age I started helping my uncle with his " Nieve de garrafa (ice cream) business. He taught me everything I know about making artisan ice cream. 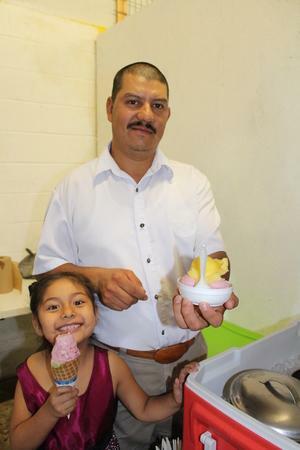 Now that I live in the U.S., and I make ice cream for my children it takes me back to when I was in Mexico and reminds me of my uncle. With the help of my wife who is supporting me, I have started my own business of making artisan ice cream in Oregon. It helps grow a natural artisan ice cream business in Hillsboro, Oregon. This year I started my ice cream business. I make artisan ice cream with exotic flavors such as corn, mamay, guanabana, avocado and many more. I decided to start my own business because I noticed that this type of ice cream is not available in Oregon and if it is it not all natural flavors. My customers are those that want to try something knew or enjoy homemade all natural flavors I offer. My goals for the future are to sell at multiple farmers markets and be able to cater to events. I enjoy talking about the different flavors of ice cream I make. Most of my clients don't even know about the fruits or that you can make ice cream out of them. With this loan I will be able to purchase a ice cream tricycle that range from $2,500 to $3,000. I would also use the loan to purchase authentic neive de garaffas equipment to make the nieves (ice cream) at a cost of $500 which I would need to get it shipped from Mexico. This loan would help me buy the equipment needed to make the ice cream more efficient. The ice cream tricycle will help us sell, promote and have a better presentation of our artisan ice cream. Antonio and Rosalva are great to work with always asking questions and following up. Rosalva is very persistent! She talks about her vision of her business and asks for feedback or ways to move forward. They have also started networking it the community and build great connections. They are a very hardworking family wanting to succeed with their new business.